It’s a good bet that a certain bicycle shop in Iowa has never held so many reporters about to completely lose it. 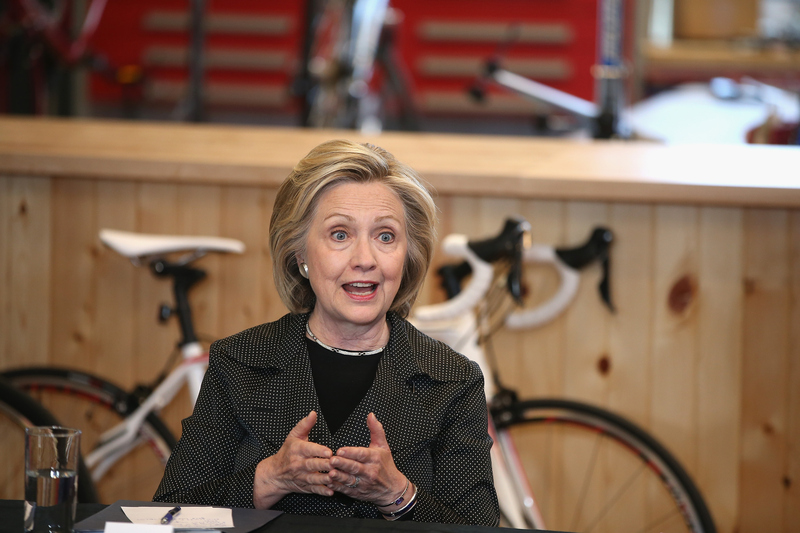 Completely out of nowhere, Hillary Clinton took questions from the media on Tuesday, breaking a 28-day silence from the press after a roundtable on small business in Cedar Rapids, Iowa. The incident inspired reporters on the ground at the Bike Tech store to send out gleeful tweets, some with photos of Clinton almost drowning in a sea of reporters, cameras and bikes. Bikes. So many bikes. The news of Clinton actually taking questions from the media trumped the actual answers Clinton gave. Clinton’s lack of interaction with the media has been the subject of much debate and analysis by the Washington press corps. Prior to Tuesday's surprise "press conference," NPR reported that Clinton has taken only 13 question from the press. The Washington Post even designed a clock that ticks down the minutes since Clinton answered her last question. The excuse from Clinton's campaign for her press silence has been pretty straight-forward: Clinton is concentrating on interacting with voters on a personal basis. Less press scrums, more face-time with voters. But now that we’ve gotten over the news that Hillz has actually spoken, what about the news on what she said? Clinton told reporters that she wanted the State Department to release her emails as soon as possible, according to Politico. “Nobody has a bigger interest in getting them released than I do,” she told reporters at the Cedar Rapids event. Vice News reported that the State Department is proposing a January 2016 deadline for making Clinton’s e-mails available to the public. But a federal judge is saying this won’t do. Reuters reported on Tuesday that U.S. District Judge Rudolph Contreras is ordering the State Department to come up with a timetable by next week to release Clinton’s 55,000 pages of e-mail on a rolling basis. According to The Washington Post, Clinton acknowledged that other political candidates had a tough week in fielding questions on Iraq and said she is sticking to what she’s written in her memoir and said in public in the past; Iraq was a mistake, pure and simple. “The United States is doing what it can, but ultimately this has to be a struggle that the Iraqi government and the Iraqi people are determined to win for themselves,” said Clinton. Clinton held back from agreeing with President Obama’s Trans-Pacific Partnership deal, which has been the subject of frustration for some Democrats. According to the Associated Press, Clinton noted that while some concerns had been raised with the trade deal and protections for currency manipulation as well as health and environmental regulations, she had to take a closer look at the trade pact in its final stages before taking a stance. "I want to judge the final agreement," Clinton said. "I have been for trade agreements. I have been against trade agreements." The “surprise” press conference was less than six minutes long. After a reporter repeatedly yelled his question about the 30,000 personal e-mails Clinton admitted to deleting (and has already defended several times), Hillz bid the press adieu and made a totally classy exit from the bike shop. The only thing cooler would be if she had ridden away on an actual bike.